I like binder clips. And I like/need checklists. Most lists we use are one time use only, like a task list. Some lists however would be very benificial if we would use them again and again. A checklist. Weather it is a procedure you want to perform 100% perfectly everytime or some things you repeatedly need to do but forget about, checklists are great. If you need further convincing why checklists are such a good idea, read the checklist manifesto. So, a checklist. I tried digital (didn’t work for me because it was too far away, too much hassle and no satisfaction checking them off). 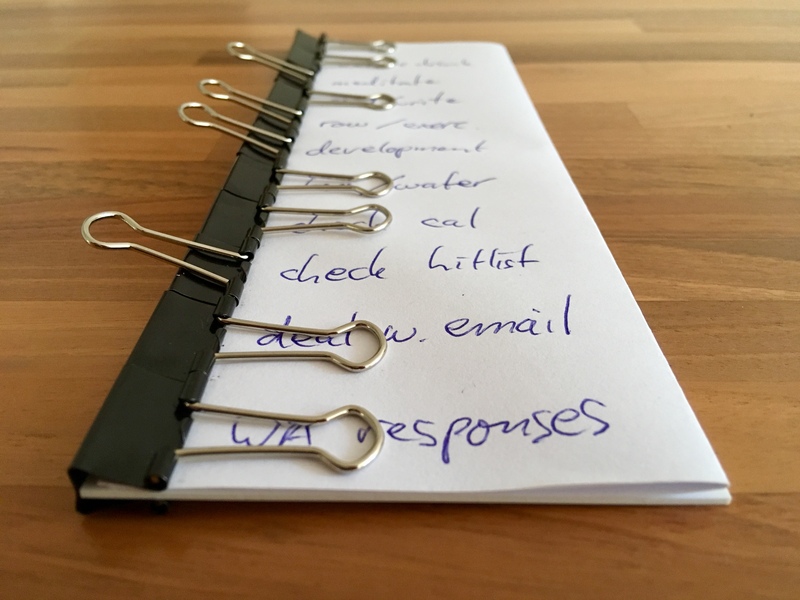 I tried a piece of paper (didn’t work for me because the required pen was often missing, felt like wasting paper and without a pen you have to remember which items you did and didn’t do, ergo the exact problem the checklist was designed to prevent). Solution? A reusable checklist. Without the need of a pen. Enter the humble binder clip. 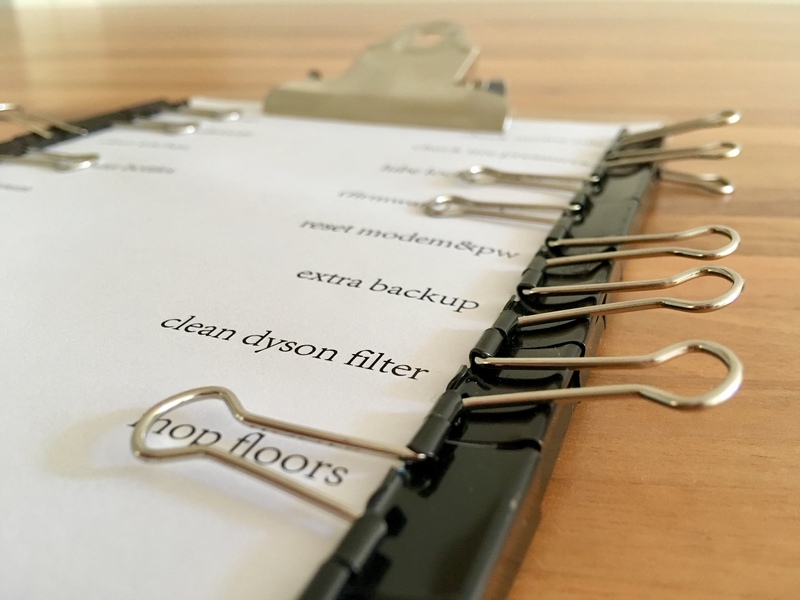 A grabbed a clipboard, put some reapeating tasks on there and stuck the binderclips next to the items. Open binder clip = open task, closed binder clip = task done. Tried it, figured out I had weekly reoccuring tasks (mostly cleaning related), monthly or so reoccuring tasks (cleaning a filter, running off site backup …) and some daily personal reoccuring ’tasks’. So I used one binder clip to indicate which day of the week or month of the year the whole list needs to be done and reset. The beauty? Flipping binder clips to the closed position is satisfying.